Rock-solid forearms and a vice-like grip are what you'll get when you train with C.P. Sports Professional Wrist Strengthener! C.P. Sports Professional Wrist Strengthener is designed to get your forearm muscles and your wrist worked up to increase their size and strength. Just attach the weights of your choice and you're set to give your arms and wrists the workout of their lives. C.P. 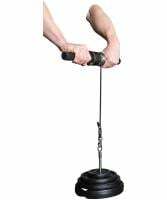 Sports Professional Wrist Strengthener features a soft grip handle, sturdy and flexible nylon rope, and a solid steel bar that can support up to a maximum weight of 30kg. Regular use of C.P. Sports Professional Wrist Strengthener will give you Popeye-style forearms plus a solid grip on anything you can get your hands on. Have a question about Professional Wrist Strengthener? What is it, what does it do, how and when to use or something else? Ask us. “Professional Wrist Strengthener” is currently out of stock. Enter your details below and we will let you know when it's back in stock.